This is an updated version of the original posting on February 5th. This version includes a updated procedures and new video clips. Search for article. The process for finding article is beyond the scope of this point, but might make a nice future one! In short, I typically use Google Scholar to find articles. I have configured Google Scholar to use my university's library, so retrieving articles is usually quick and easy. Download PDF, Save in Dropbox. I use Dropbox as the primary mechanism for transferring files between my computer and my iPad. Dropbox is free and a lot of applications integrate with it directly, making is a practical way to share files across devices. The software must be installed on both your computer and your iPad. If you don't already have a Dropbox account and are planning to sign up, I'd appreciate it if you used my referral link, as it gives me more "free" storage space. Open in iAnnotate. The first time you use iAnnotate with Dropbox, you need to setup the connection between Dropbox and iAnnotate. Fortunately, iAnnotate has added a connection type of Dropbox, which means all you need to do is add your Dropbox account information and it just works. The process for doing this has changed a few times with each new release of iAnnotate. This video shows the current process for configuring Dropbox in iAnnotate. Read and Annotate. For details on how I do this see the video: How I use iAnnotate to mark up PDFs on my iPad. Email Annotations. This is another one of those buried iAnnotate features. I click the tool box and under Document there is an option to E-mail Annotation Summary. This allows me to email all the text that I highlighted in the document, so that I don't need to type in any quotations, and it allows me to store the key quotes in notes. Delete file from orignal location. I have setup Mendeley to organize and store my files. Mendeley stores them in a folder which is also on Dropbox, as well as a copy on the Mendeley server. In order to avoid multiple copies of the same file, and the associated confusion over which is the "current' version, once the file is in the Mendeley file folder, I remove all other copies. Delete file from iPad. Finally, I go into the iAnnotate library and delete the file from iAnnotate. 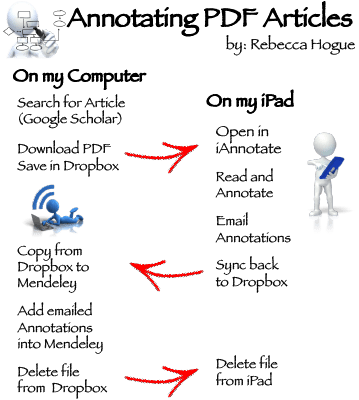 If I want it again, I can always get it from the Mendeley Resource directory on Dropbox. That's it! That being said, the process is a little more convoluted that I'd like it to be. It would save me a fair bit of file management if Mendeley would integrate with iAnnotate. Mendeley does include some annotation capability on the Mac, but it doesn't transfer to the iPad and the Mendeley PDF viewer on the iPad isn't nearly as good as iAnnotate. I use Easy Annotate myself, and can advise it to anyone who wants to annotate PDFs on an iPad. It has a unique feature which I enjoy, namely being able to view and edit two pdfs next to each other. This works magic for study projects with reference documents. Note: I developed Easy Annotate, because there was no alternative. Very useful information, thanks for sharing. I’m flirting with going paperless and this helps me see how it would work. I think the varied levels at which you present information makes it particularly useful. E.g. high level explanation, detailed explanation, illustration, and video examples. Very rich.